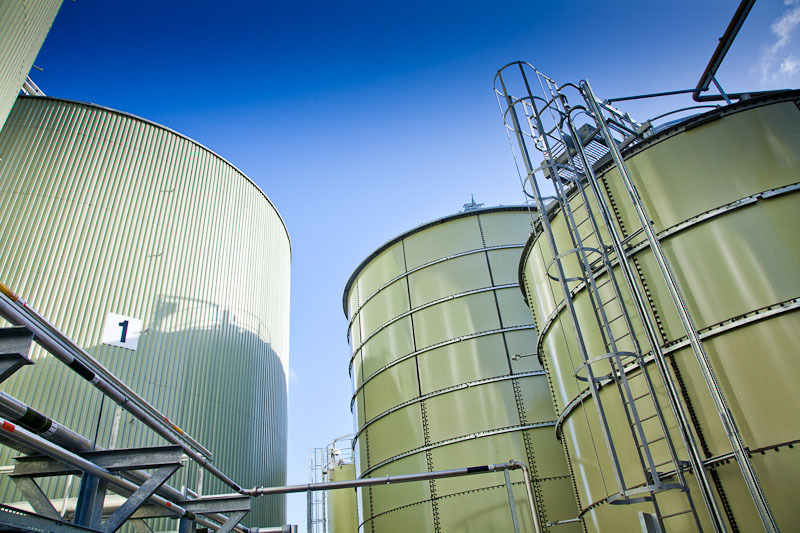 The glass fused steel sectional reception tank in an anaerobic digestion plant had become affected by the harsh environment. Corrosion had perforated the tank, and damaged the polyurethane sealant. The asset owner had hired another contractor to apply a protective lining to the tank. However, this protective coating was not a success, and within 6 months it had already broken down significantly. 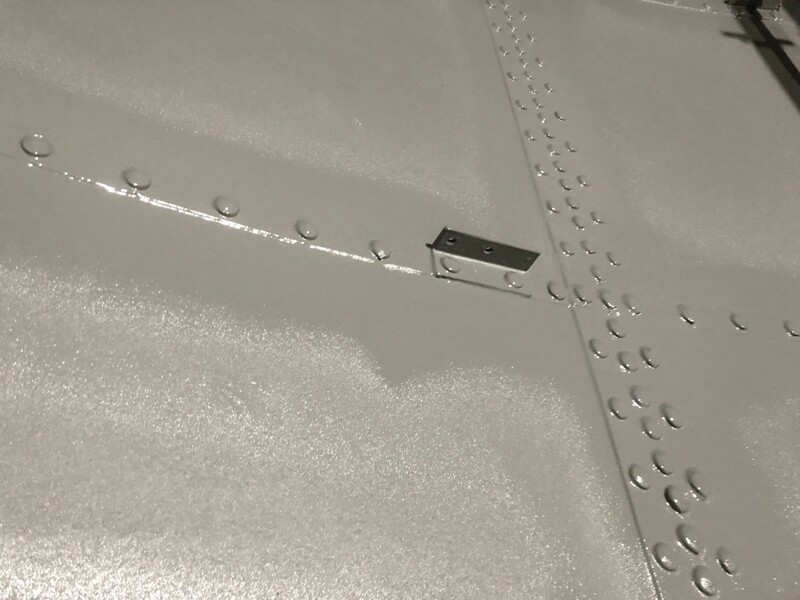 The protective lining needed to adhere to glass fused steel – known to be a particularly difficult surface to adhere to, as evidenced by the failure of the previous lining. SPI’s Corrolastic UB polyurea protective coating was chosen as the ideal product for the job. We chose our own Ultra High Pressure water jetting unit as the perfect means of removing the failed tank lining. 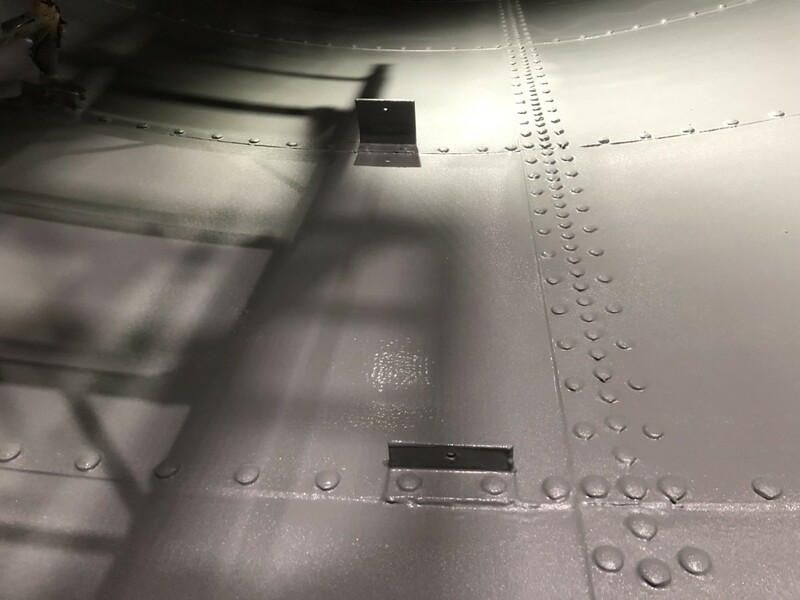 With a thickness of around 1000 micrometers, and a slight degree of flexibility, the protective lining would have been hard to remove with only abrasive blasting. However, the UHP water jet removed it in moments, thanks to the tearing action of the unit’s rotary head. The client had already cleaned the tank before work was started. However, it soon became apparent that large amounts of grease and fat were still coating areas of the tank walls. 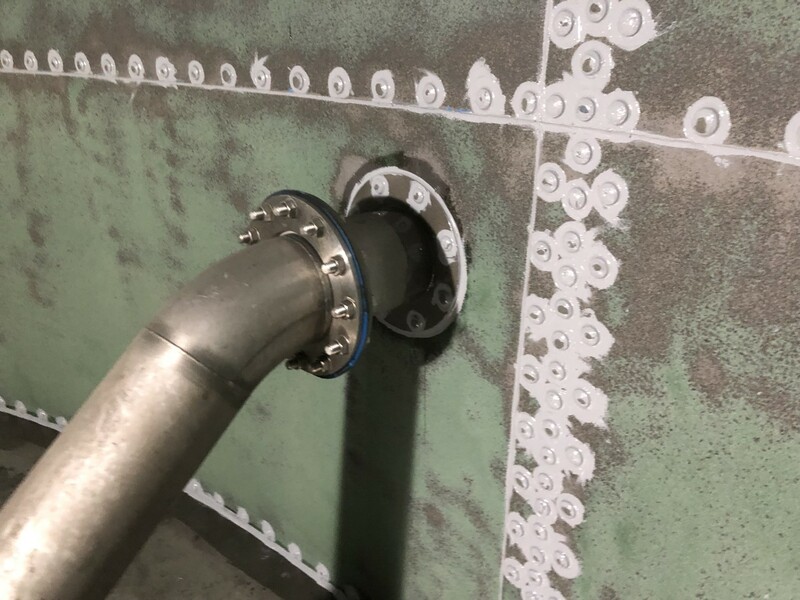 We needed to ensure the tank walls were pristine in order to guarantee perfect adhesion of the new protective polyurea coating. An emulsifying degreaser was used on the walls, alongside a hot washer, to remove any remaining traces of grease on the walls. This also helped remove any soluble metal salts and chlorides in preparation for the abrasive blasting. A black light was used to double check that the tank walls were completely clean. Once the inside of the tank was clean, abrasive blasting was used to prepare it for the protective lining. Exposed steel surfaces were prepared to SA2.5 in line with ISO8501-1, with steel and remaining glass enamel meeting a minimum surface profile of 50 micrometers. A surface profile needle gauge was used to check the entire surface. Once the surfaces were blasted, clean water with an anti-corrosive agent was used to wash away any detritus. 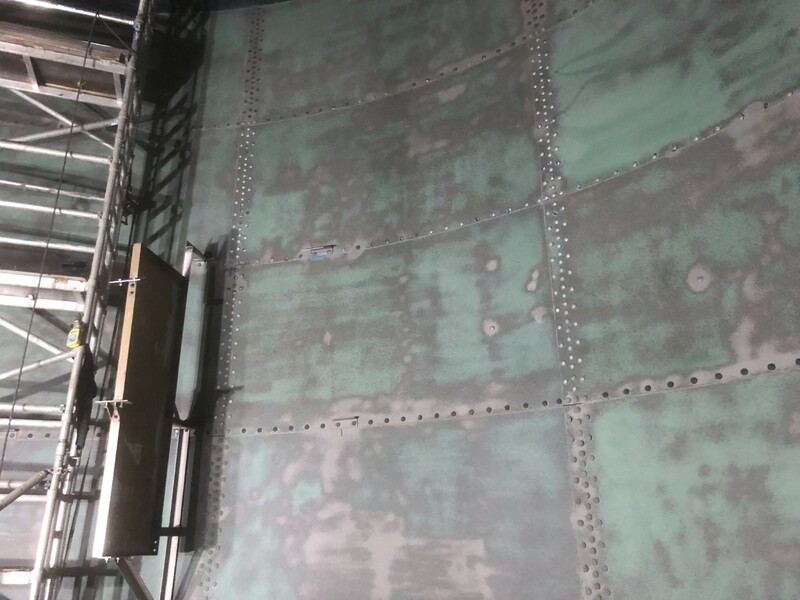 By the end of these preparatory steps, the interior surfaces of the tank were completely spotless, and ready for the application of the polyurea coating. Thorough cleaning also helped prevent any flash rusting on the blasted steel. De-humidification equipment helped maintain the blast standard. 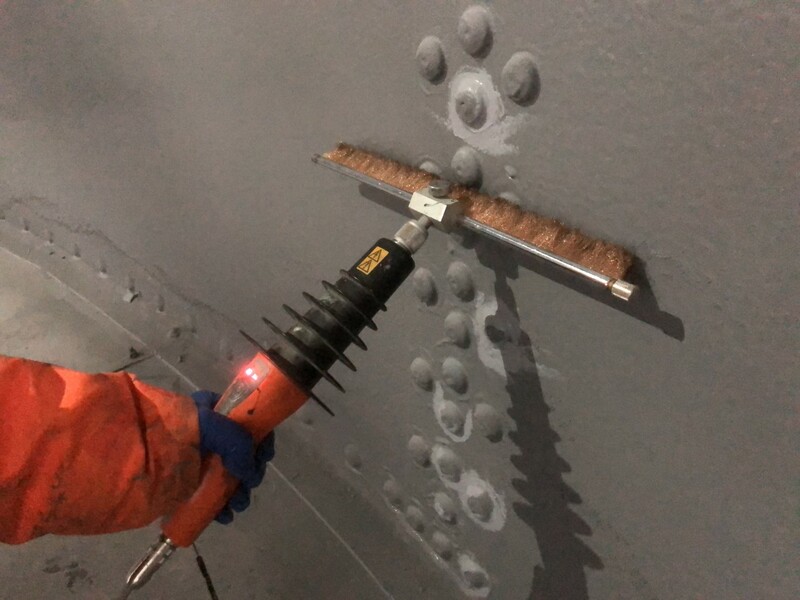 Soluble salt tests were carried out, guaranteeing that the environment did not exceed the permitted salt levels for SPI’s Corrolastic UB polyurea coating. A polyurethane jointing compound was used on all seams and boltheads, providing a more suitable surface for application of the new polyurea lining. This also helped isolate the potential points of movement from the protective lining. Corrolast DSP was used to prime stainless steel overlap and termination areas. This epoxy primer was specifically designed for difficult substrates, and was the ideal solution for the stainless steel tank surface. Once all priming and preparation was completed, a Corrolastic UB polyurea protective lining was spray-applied to a 2.5 mm thickness. SPI’s AE4 adhesion promoter allowed the polyurea coating to create a firm bond to the substrate, without necessitating the use of primers. A DC holiday spark tester was used to check for any porosity in the protective lining. 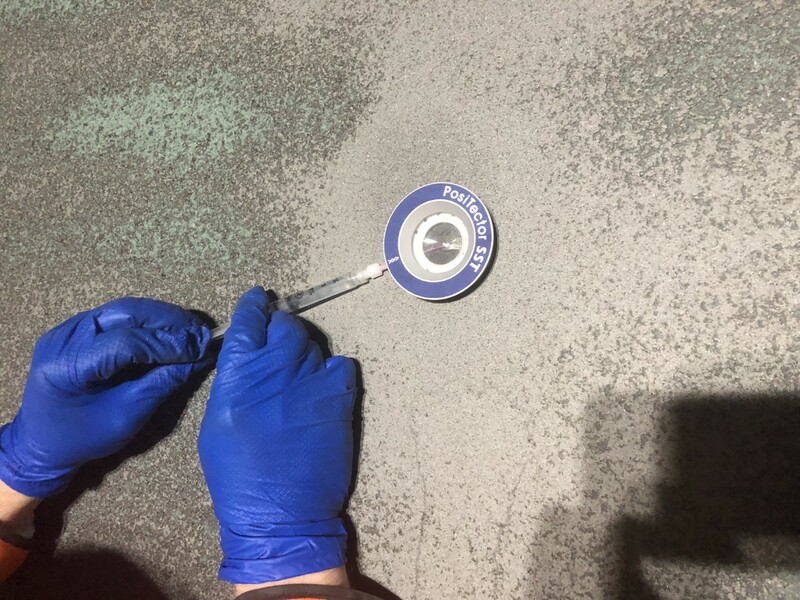 Any pinholes found were marked, and treated using the same Corrolastic UB polyurea coating. This was made easier by the fact that SPI’s Ultrabond molecule allows for the application of a polyurea lining, even after the conventional recoat window has passed. The Corrolastic UB polyurea lining proved a success. 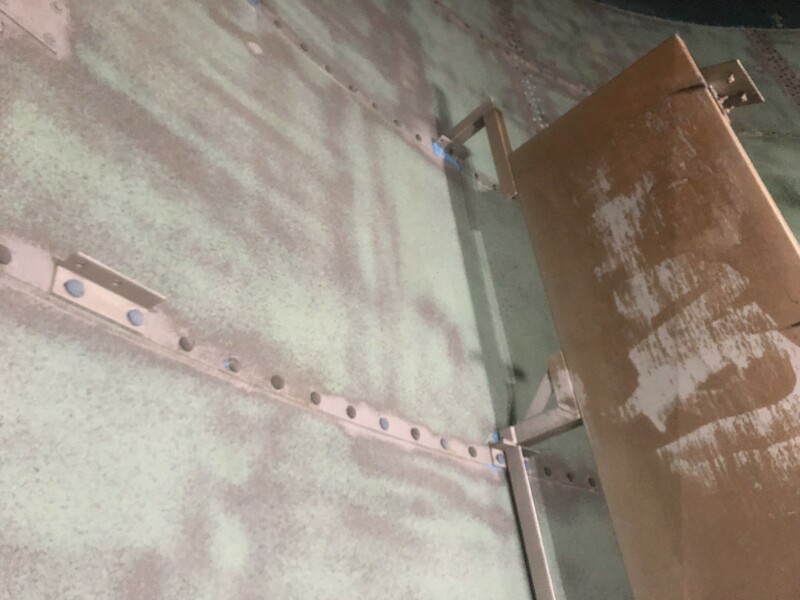 Thanks to a thorough priming and preparation process, the polyurea coating was able to adhere completely to the interior of the tank. 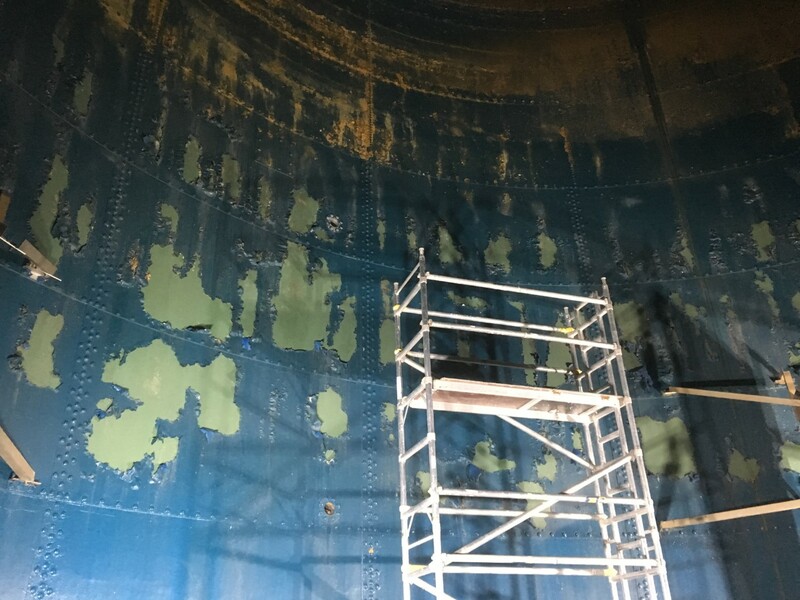 Unlike the previous failed protective lining, SPI’s Corrolastic UB was able to remain effective, and ensure that the glass fused steel tank could stay in operation. See Corroless Eastern‘s website for the full story.